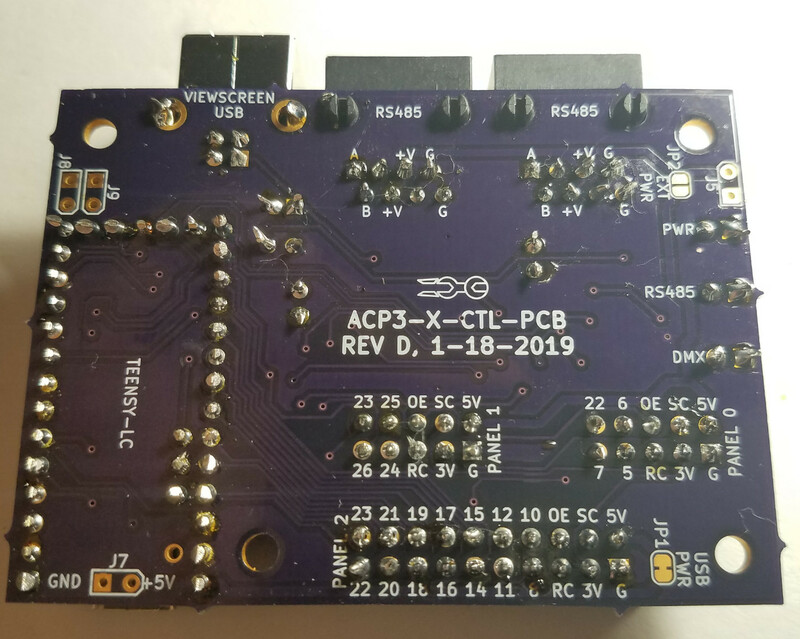 You have amazing timing, I was thinking about trying to build controls and if you make kits available I'd gladly do that rather than re-invent the wheel. I am looking forward to getting some kits ready to go in the next month or so. I am adding a post today outlining what I have in mind. Hopefully, people here will find it useful and do some amazing things. 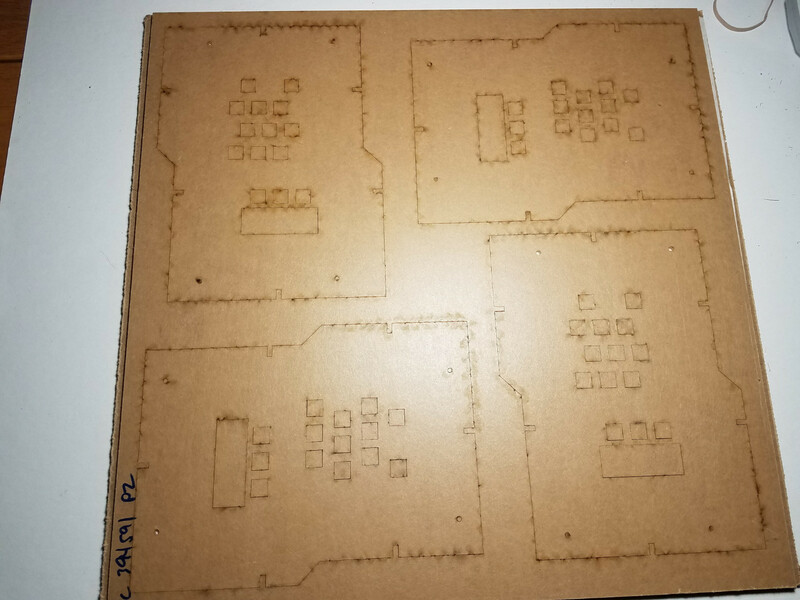 PCBs for the controller boards arrived yesterday. Assembly went very smoothly and the initial testing was a breeze. 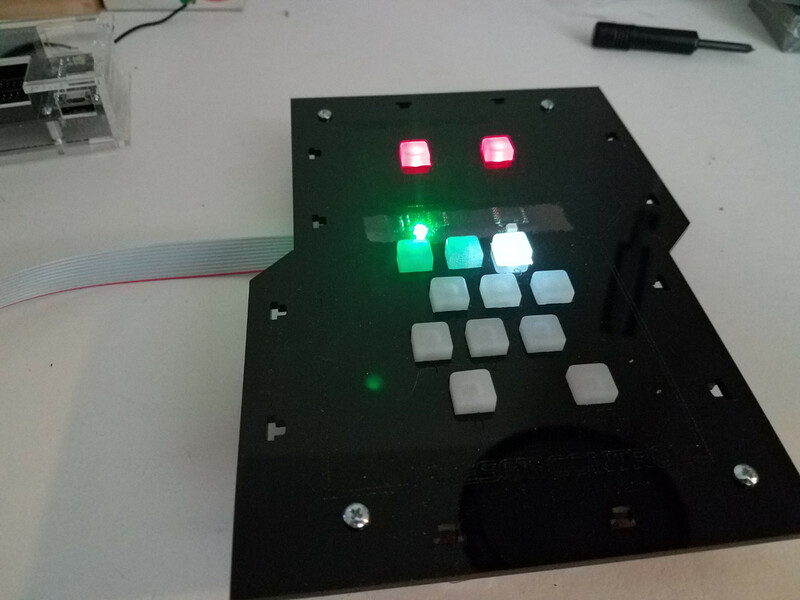 I took the DMX-reading / panel communications code from the Block III main controller and stripped out the keypad and lights stuff. After plugging it in with the other panels, everything worked just like before. Therefore, the master control functionality checks out. 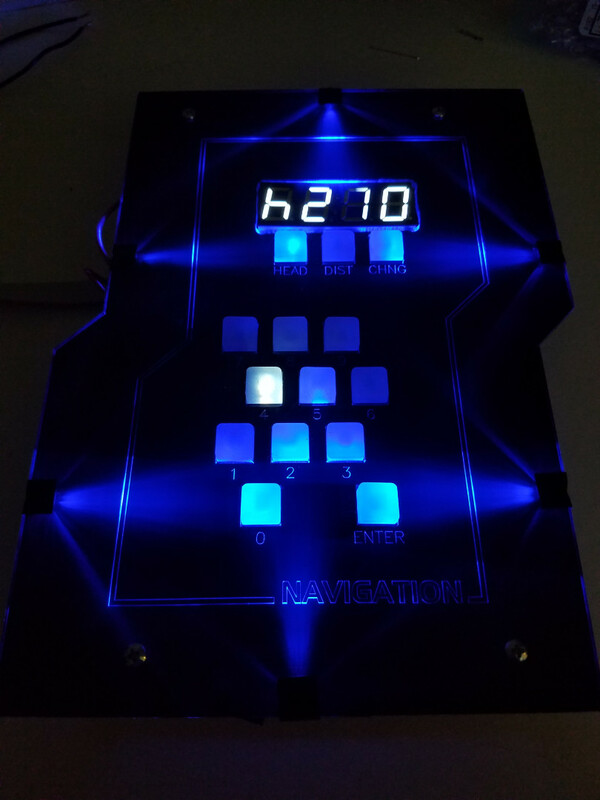 The last steps will be to verify control panel functionality and design a proper housing. 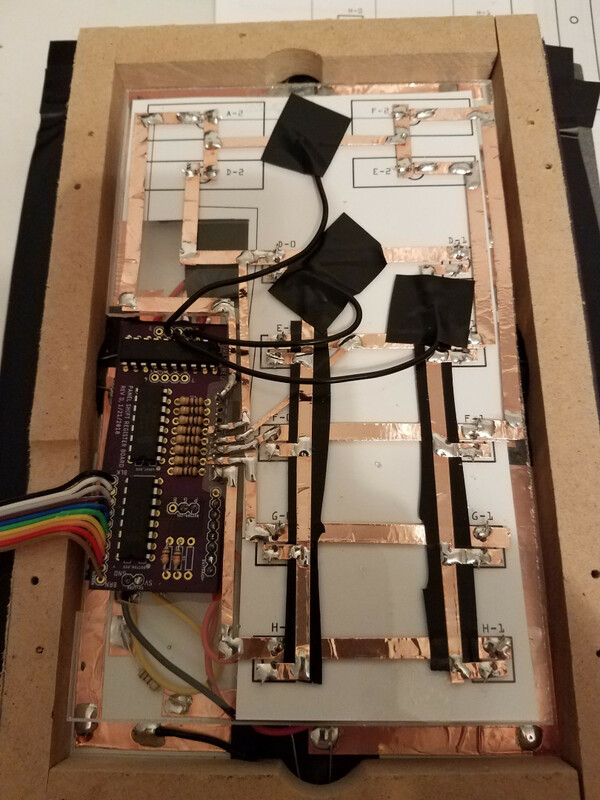 Level I: wiring schematics, PCB design files, Arduino code, and data tables -- this level is for bridge builders who want to build everything from scratch, but would like some guidance on some of the electronics details that I worked out on this project. Everything will be provided either here or in another online repository. No cost to the bridge builder. 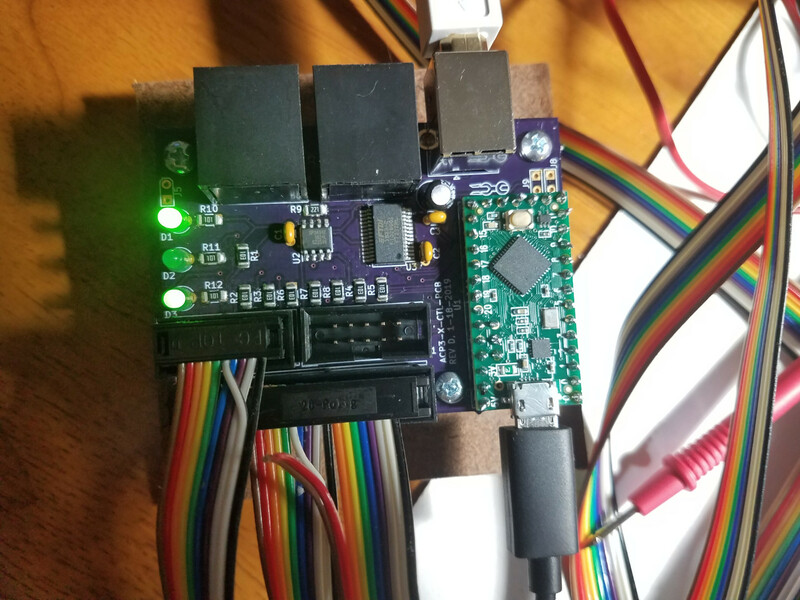 Level II: control boards and panel developer boards -- this level is for bridge builders who would like the ease-of-use of the centralized controllers, but want to implement their own button layouts and designs. 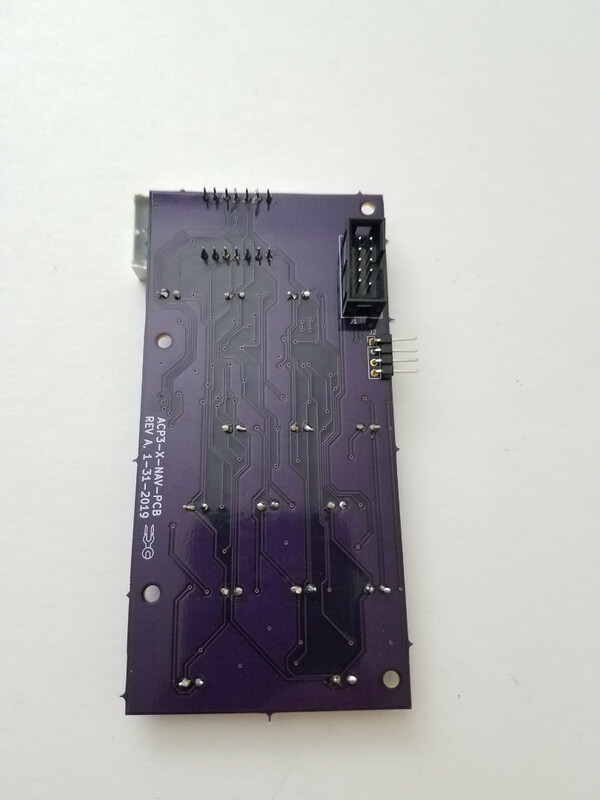 The hardware for these kits will include a built controller board, ribbon cables with connectors, and three panel boards (see shift register photo below). There is a nominal cost to cover parts, assembly, and shipping. The boards from this level are essentially the starting point to how I built the Block III panels featured in earlier posts. 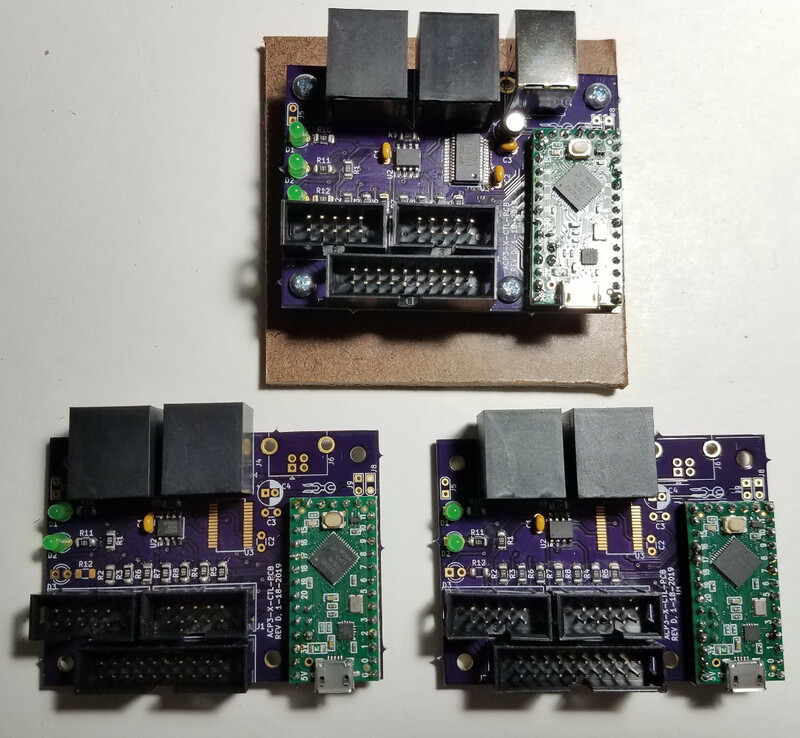 Level III: control boards and control panel kits -- this level is for bridge builders who want to drop in functional controls in the least amount of time possible. 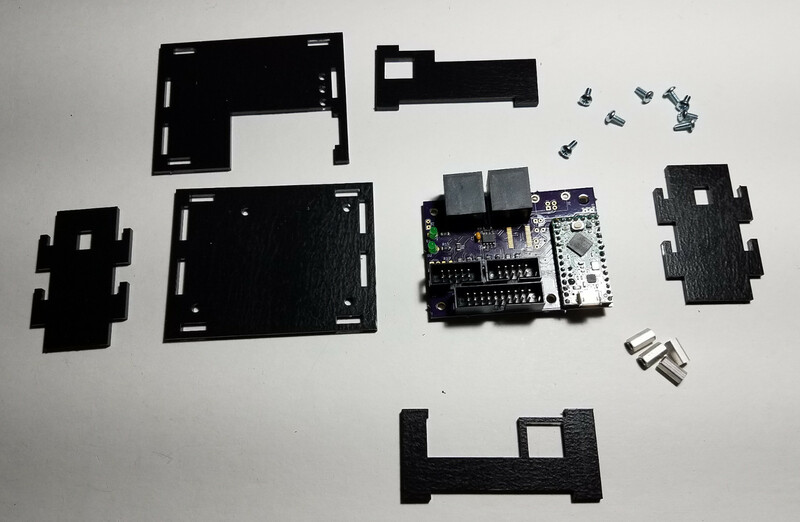 The kits will include a built controller board and housing, ribbon cables with connectors, control panel boards, and faceplate parts. 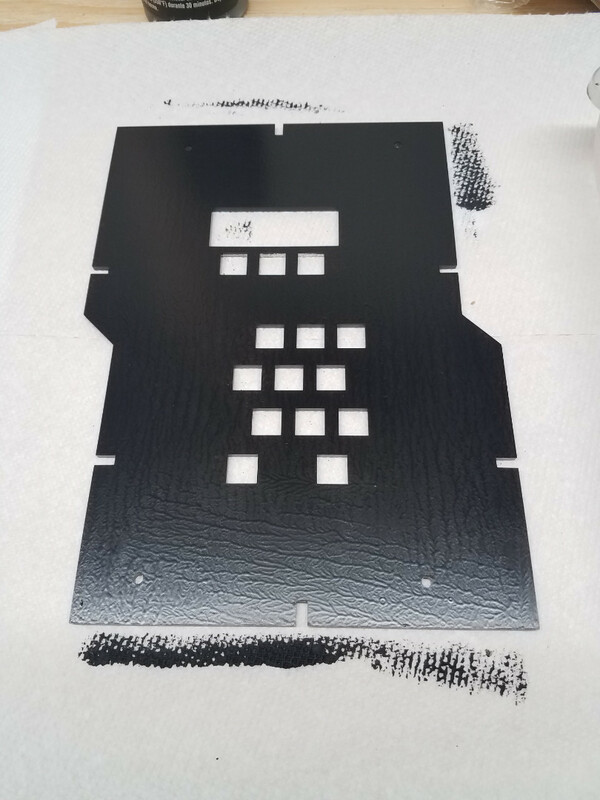 For back-lit panels, the bridge builder will need to paint the pre-cut acrylic faceplate and mount the edge LEDs. All electronic parts are provided. Acrylic housings and faceplates are provided. Paint, furniture, and any other design decisions outside of the functional buttons fall to the bridge builder. 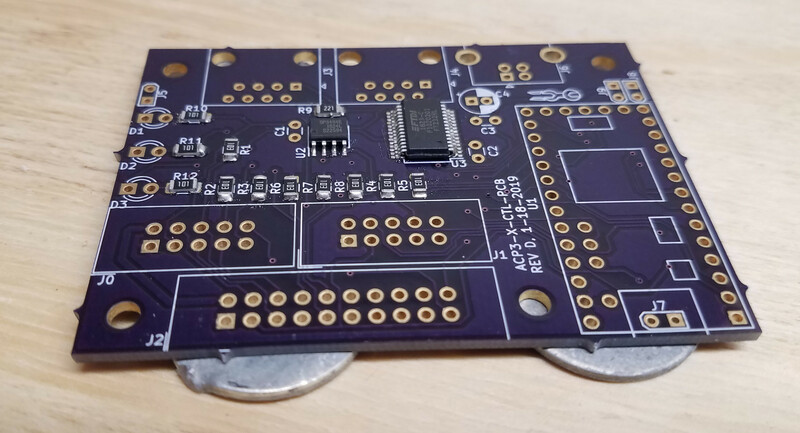 Cost will cover parts, board assembly, and shipping. Paint and final assembly labor are not included. That's really cool. If you PM me when you are ready to sell Level IIIs, I'd gladly be one of your first customers. The time savings of it would be great and I'd happily help spread the word to other groups. Angel you continue to amaze!!! What are you using for your ribbon cables? 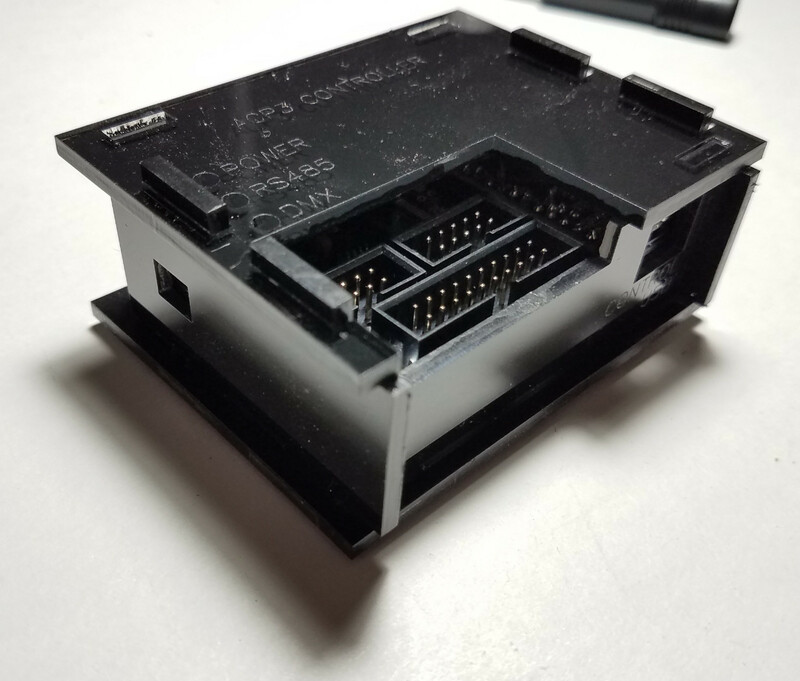 Are you crimping your own connectors or do you have an easy source for them otherwise? 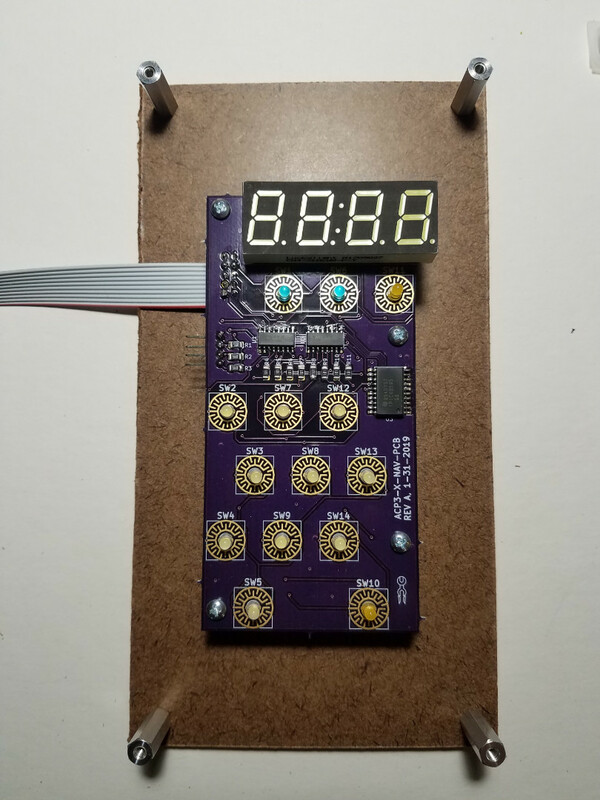 Also, are the shift registers a workaround to the limited inputs of the teensy? Angel you continue to amaze!!! 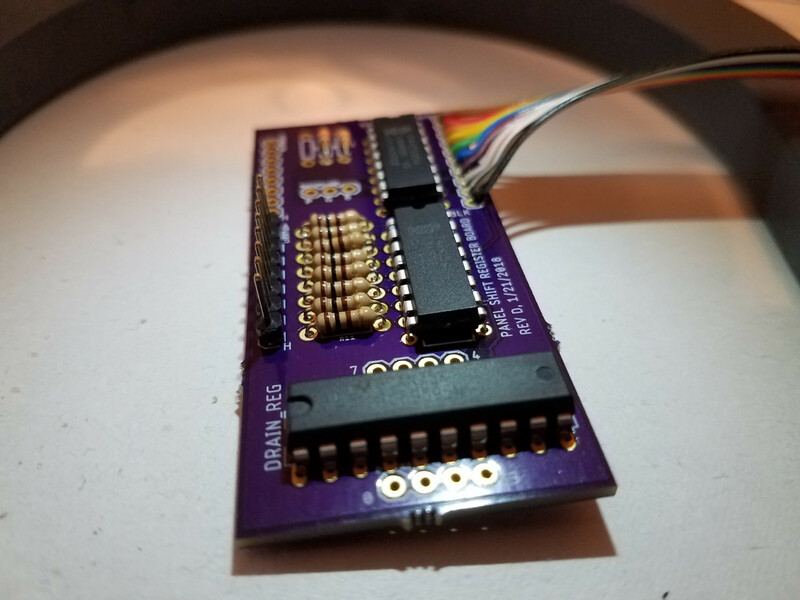 What are you using for your ribbon cables? 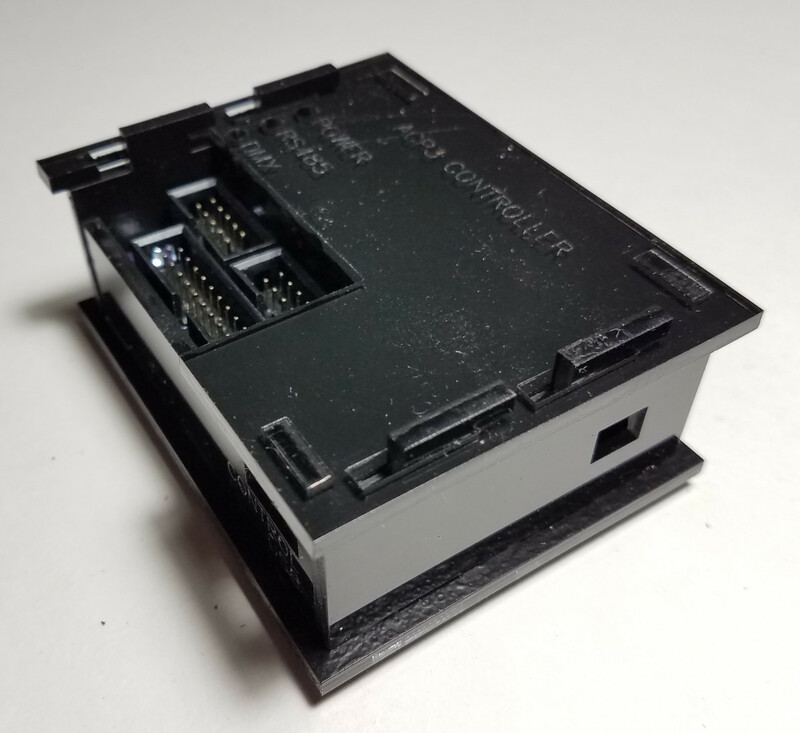 Are you crimping your own connectors or do you have an easy source for them otherwise? This way, I can make them whatever length I want. Also, the parts are cheaper than assembled cables. It is part of the equation for hobbyists versus businesses. For most businesses in the US, saving labor is the priority, so pre-assembled cables probably make more sense. For hobbyists, saving material cost is the priority, so buying the parts makes more sense. 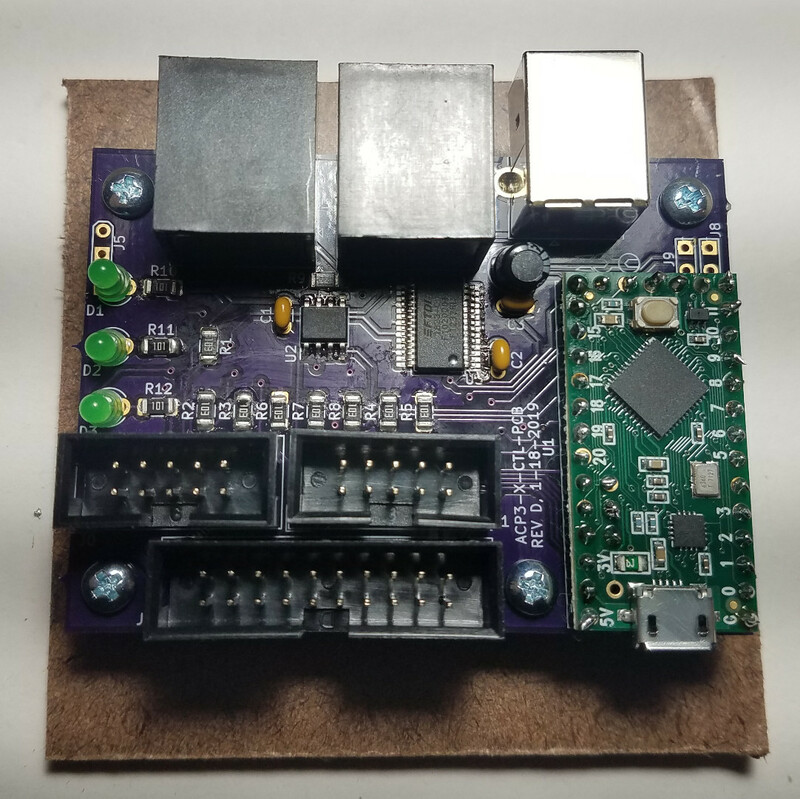 Because these kits are a hobby for me rather than a business, I have a freer hand to do a combination of things that makes my job easier while still economizing materials. Yes and no. 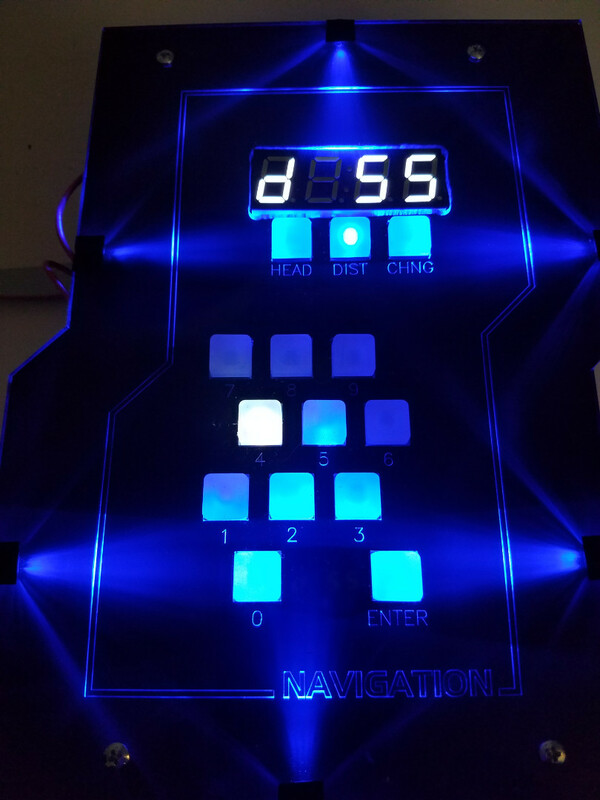 Having the shift registers greatly increases the number of lights and buttons I can control using the Teensy-LC. 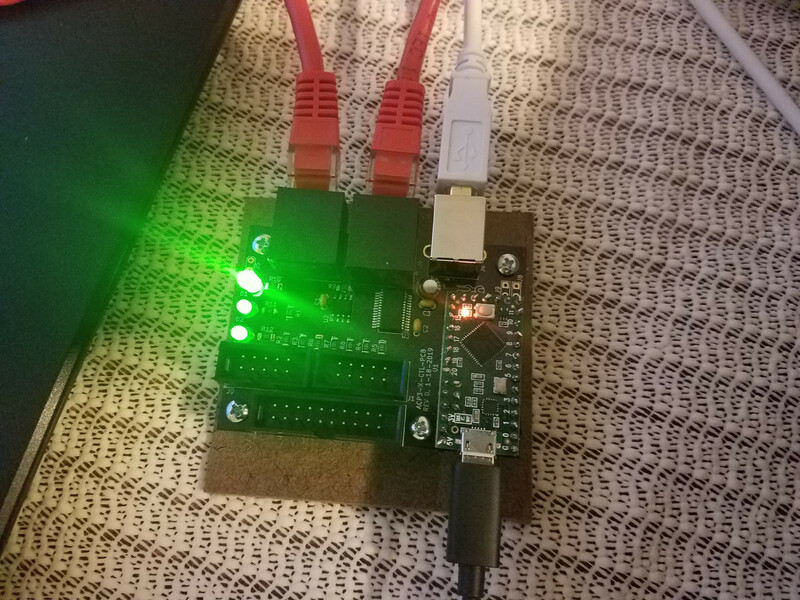 For example, with 6 pins (SRCLK, RCLK, OE, SER, read pin 1, read pin 2) I can control 64 LEDs and 16 buttons using my shift register boards. 3 of those pins are shared between panels, so it's really only 3 pins. Theoretically, the number of LEDs is endless, given a fast enough clock speed. 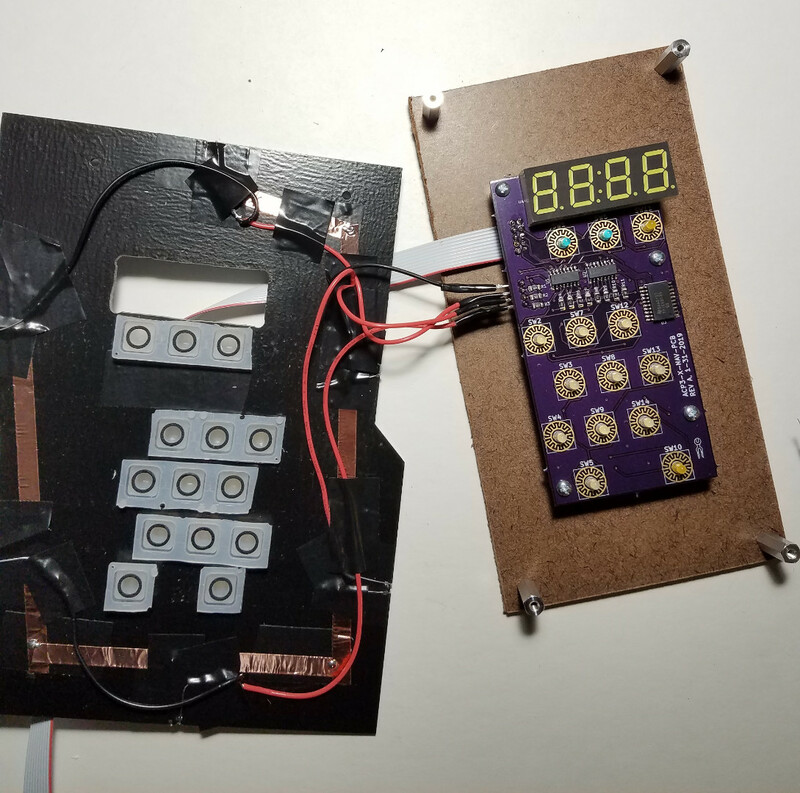 However, my other motivation for having shift registers was to have modular control panels that had a relatively small number of wires to connect them to the common control board. 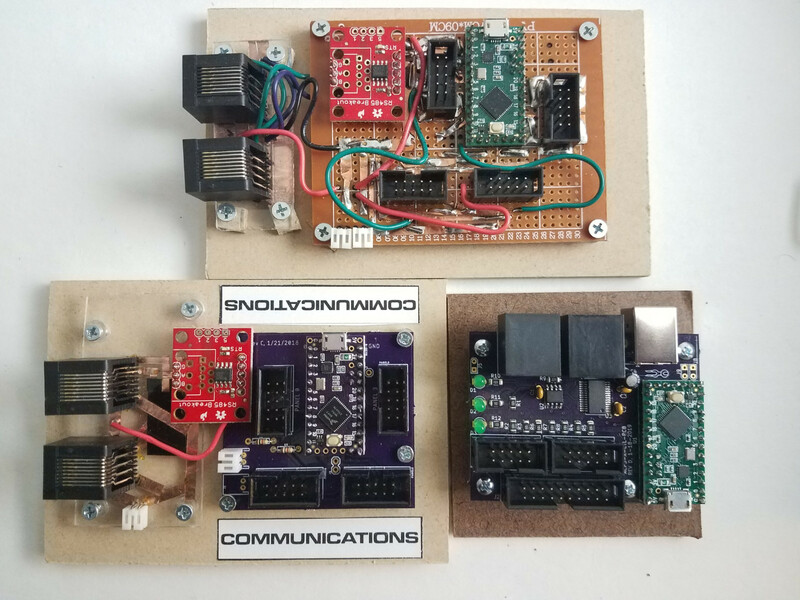 Taken together, these two factors dramatically reduce the material cost over other commercially-available microcontrollers while limiting the number of wires between panels. 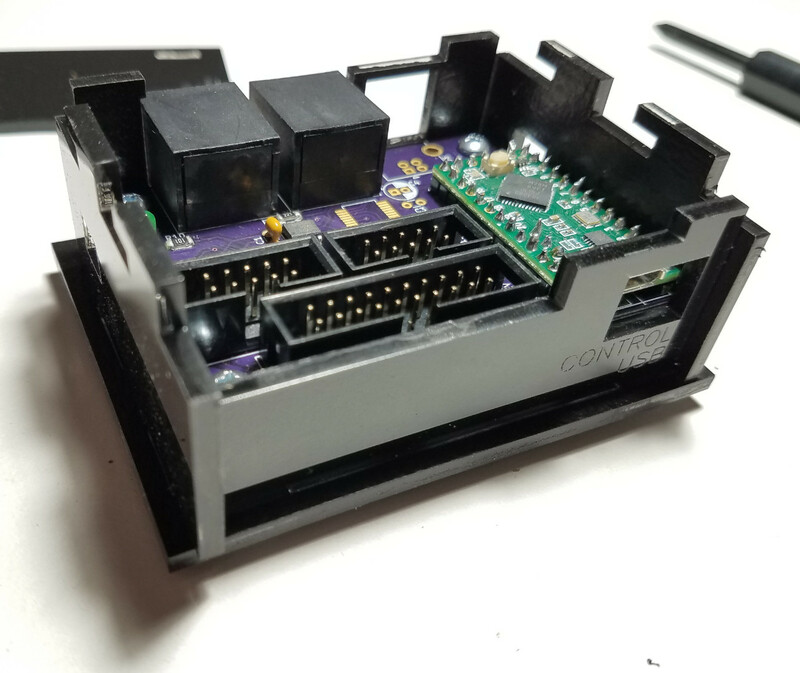 Do you have a link to the male side of those connectors? I'm thinking they'll make a big difference on my design as well. 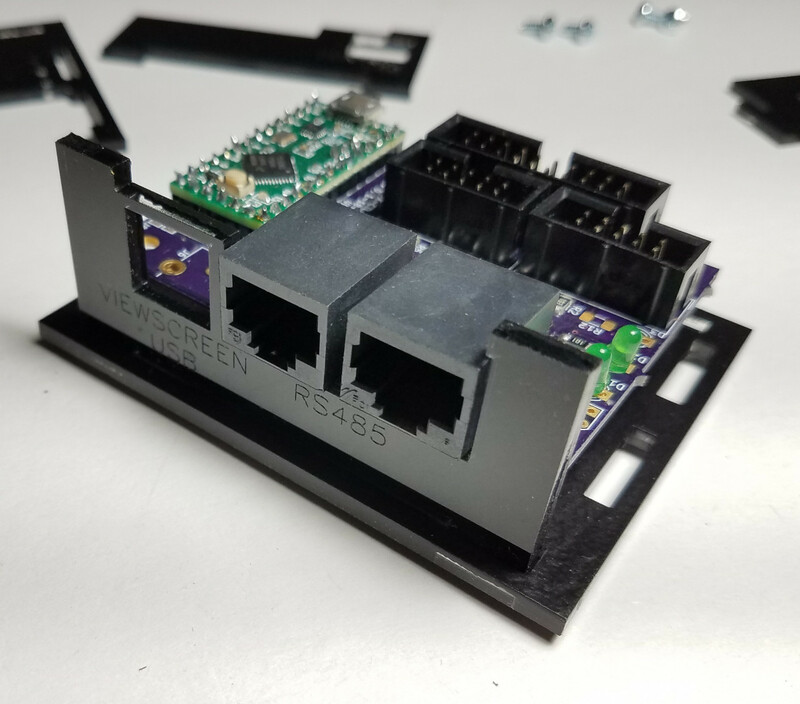 Make sure to check out the links at the bottom of each product page to find compatible parts and also different lengths of cable. I am buying the ribbons 100' at a time since I am planning to outfit a number of panels. Shorter lengths may be more appropriate for others. Since the ribbons are essentially using "in-the-case" logic signals, they are only good for very short lengths anyway. 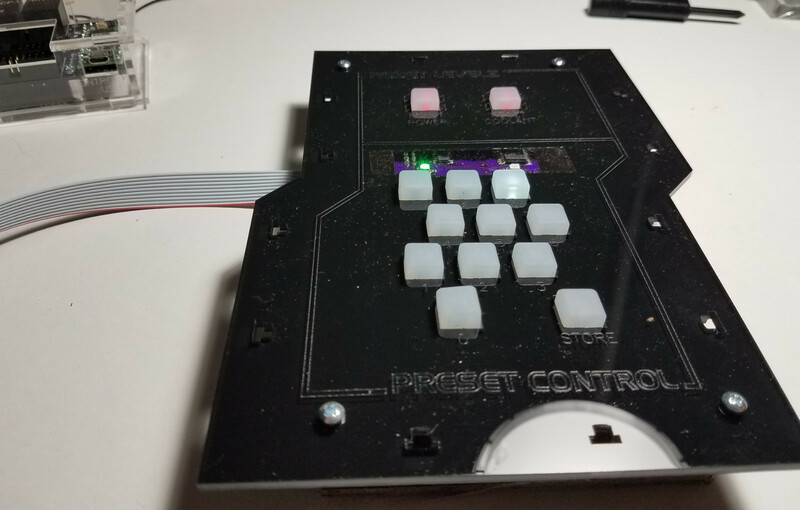 Completed testing of the controller today. Everything checks out. 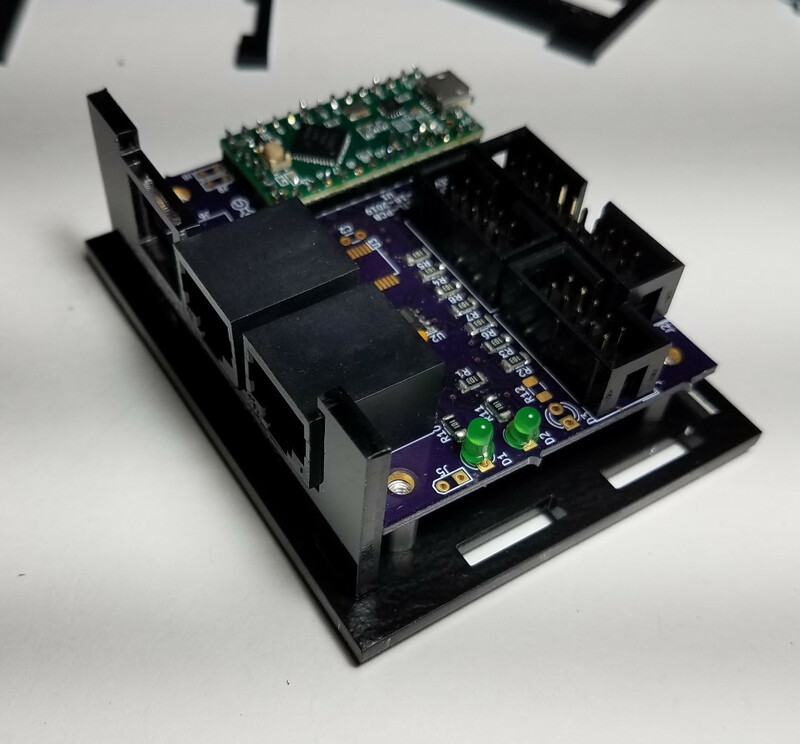 The new controller is able to function as both the control panel processor and as the "master controller" (DMX interface/RS485 token manager), thereby reducing by 17% the number of controllers needed to outfit a bridge. 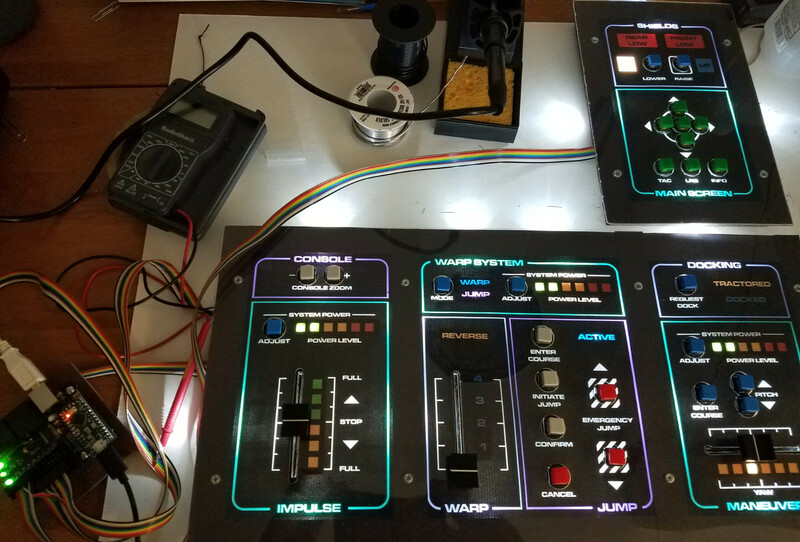 Next steps are to design, build, and test the new control panels. 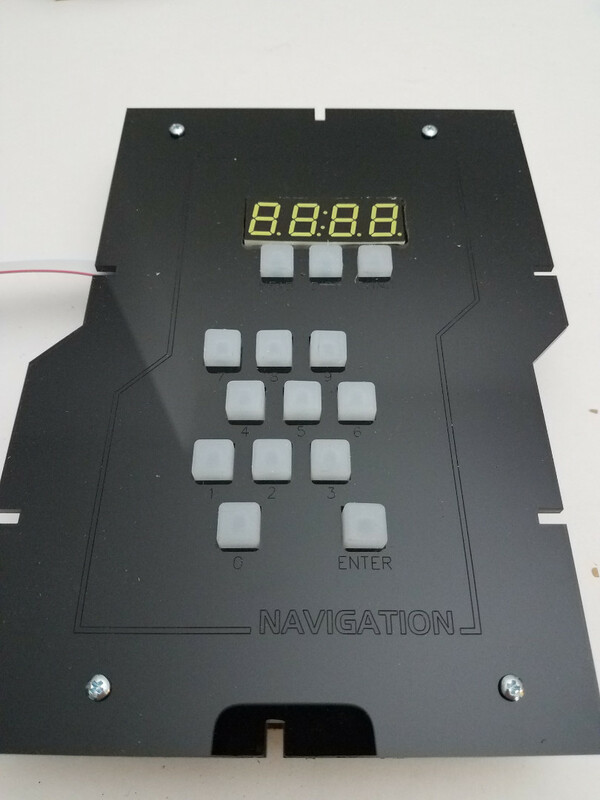 I have the first of the new PCBs on order - it is a new navigation keypad for Helm. Should have it up and running in a week or so. Thanks everyone for the kind words. I had a great time hanging out with all of you! Definitely looking forward to doing it again. Also, if any of you are planning to go to GenCon, please let me know. It would be fun to get together for a bit and, who knows, even play a few rounds. Wish I'd known you'd be there. 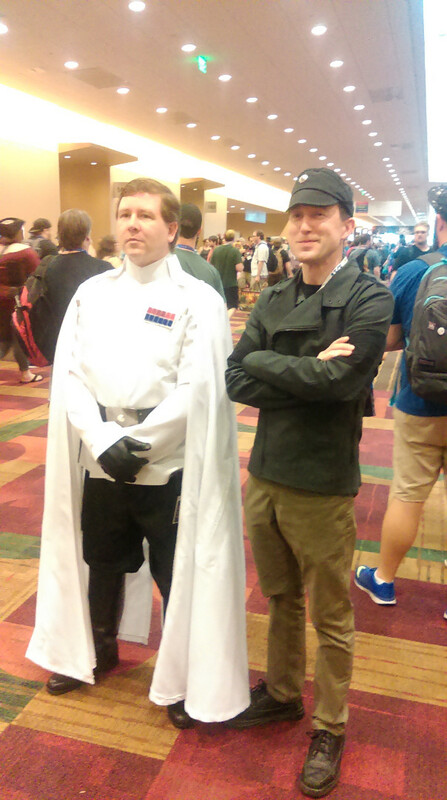 I'm at gencon every year! My crew played a little Artemis too, over in LucasOil stadium. For a couple of them it was not only their first Gencon, but their first Artemis too. They loved it. You (or anybody else on the boards for that matter) planning on going this year? I'll be there with one of my daughters. 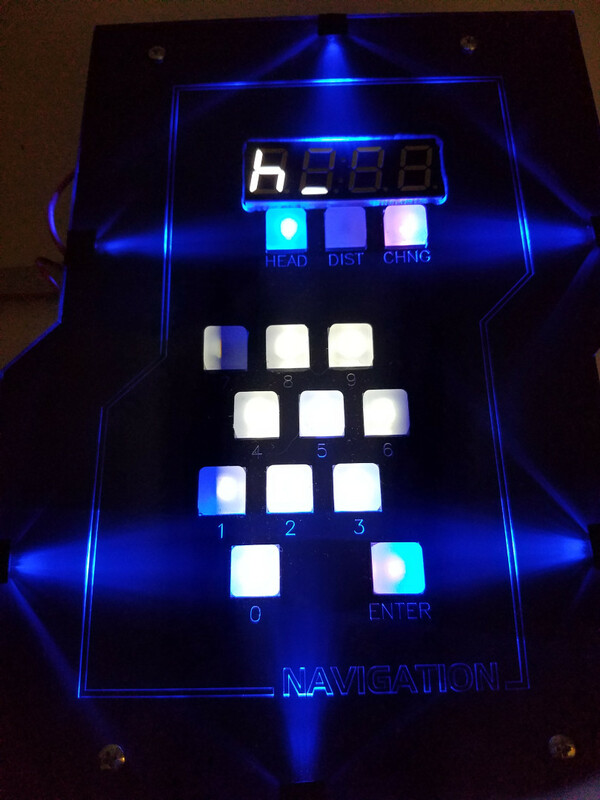 The faceplate and PCB for the new navigation panel arrived, so I was able to assemble them and test my new ideas. I picked the nav panel to test because it has several features common to the new panels, but on a smaller scale. Also, I want to replace the old one with something a little more intuitive. 3. diffuse LEDs will likely work better than the narrow illumination LEDs I used in the first test. 5. squishy light-up buttons are working as advertised. They are less expensive and look better than the clicky buttons for this project. 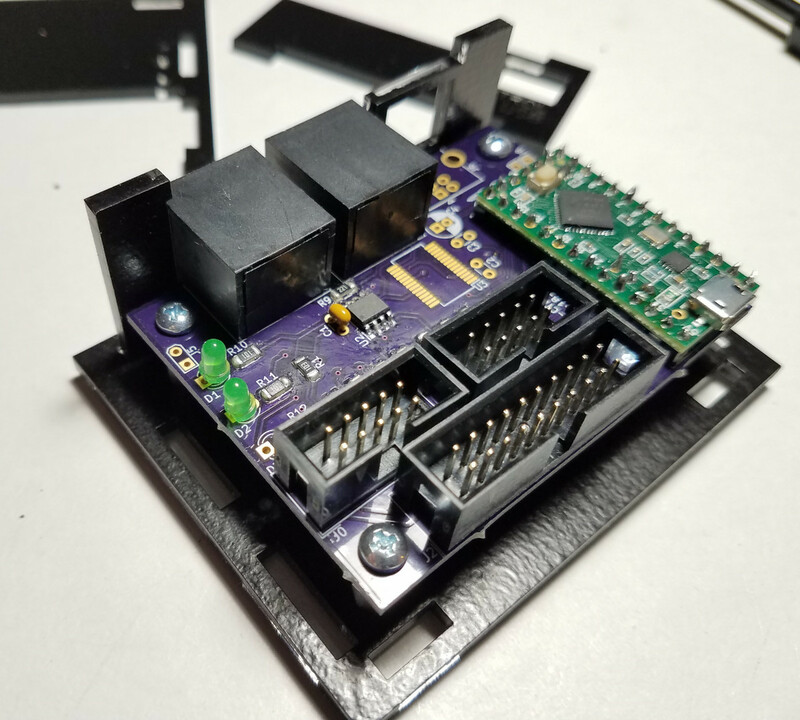 Housing design for controller boards is now complete. Assembly steps shown below. 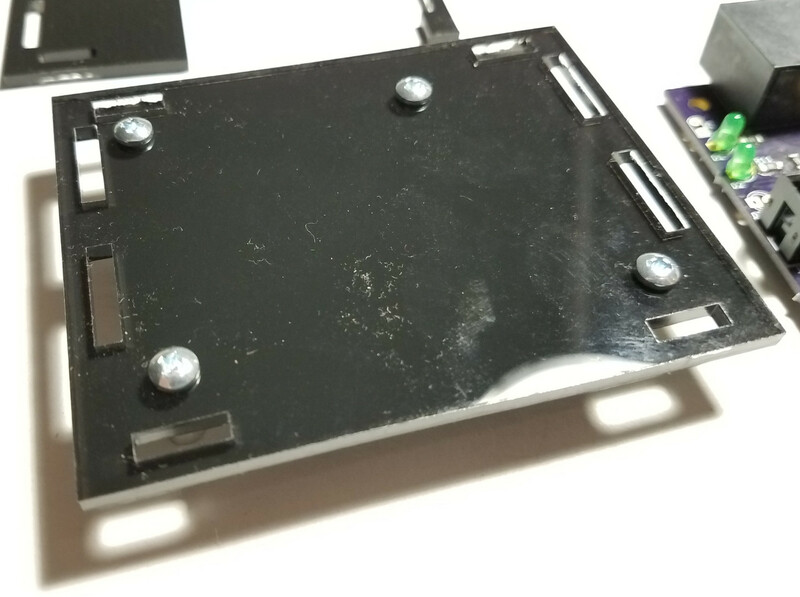 insert bottom tabs of back plate into base plate and position PCB over standoffs, sticking RJ45 jacks through opening. 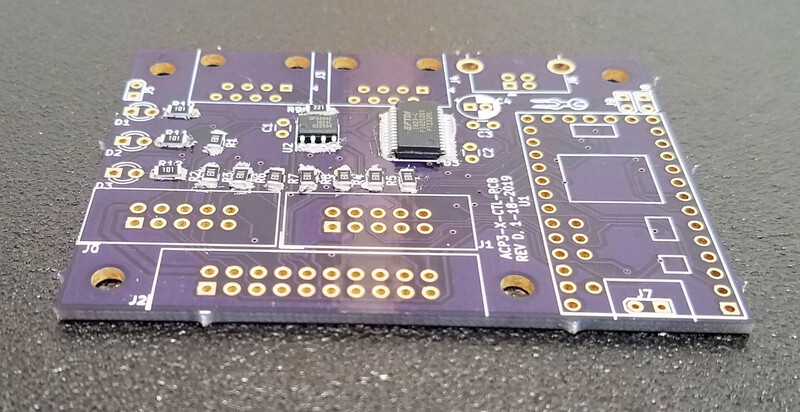 Note: bumps on edges of PCB may need to be cut off using a hobby knife so that the housing will fit. 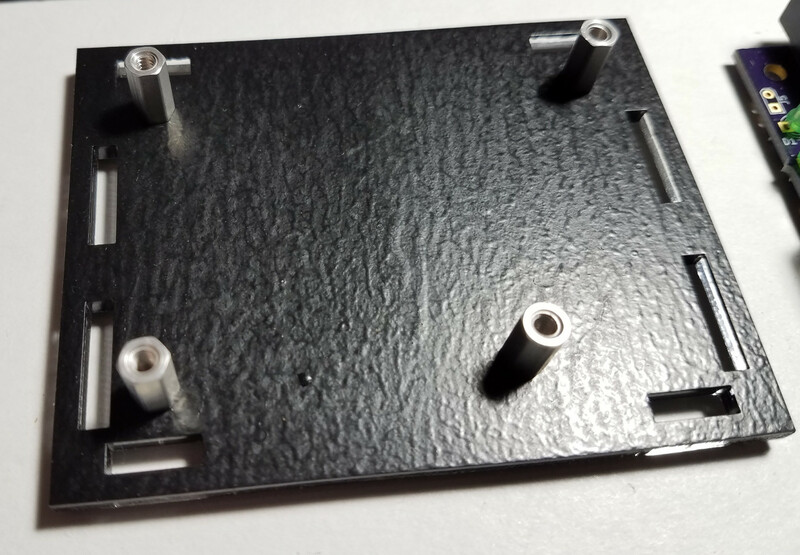 Some of the parts arrived for the engineering preset key pad. Still waiting for new edge light assemblies. I know I keep asking you a ton of questions, but where did you source the switches and buttons for the early versions of these panels? (Like back on page 1 of this thread? Nevermind - found it back in post #29.